A loaded baked sweet potato is just one of many dishes you can make. When compared to its bland counterpart, sweet potatoes take on an exotic glow. With their spicy, sugary taste and beautiful orange flesh, sweet potato is a remarkable vegetable that is a perfect starting point for culinary creativity. Despite the name, sweet potatoes are not closely related to the ordinary potato, although they are both root vegetables. While both species hail from the Solanaceae family of plants, potatoes come from a variety of nightshade, while the sweet potato comes from a variety of bindweed or morning glory. 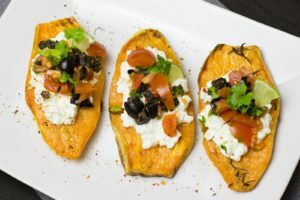 Sweet potato has earned a reputation for being a healthier alternative while in reality, it’s not that much different than its place cousin. When you look at the carbohydrates, fiber, and caloric content, the two are highly similar. Meaning, you can’t just swap your potatoes and hope for a considerable change. That said, sweet potato is high in plenty of vitamins and minerals like C and A, which make it a great, nutritious addition to a meal providing you aren’t deep frying it. For almost any recipe where potatoes are used sweet potatoes could be added instead. On your breakfast menu consider a sweet potato hash to use as your meals foundation. In the fall and winter, this hearty warming vegetable can help get your day started right. One of the many benefits to sweet potatoes is how versatile they can be; sweet, savory, salty, spicy, sweet potatoes can do it all. Used as the base for a loaded baked potato, sweet potatoes leave more room for creativity. When mashed with garlic and spices they can be used as a unique lid for a shepherds pie. When blended and mixed with other ingredients, sweet potatoes serve as the perfect soup base. They can help to thicken soups and make them creamy without the use of any milk or dairy products (although a curried sweet potato and coconut milk soup is delicious). FRESH, ORGANIC FARM-TO-TABLE INGREDIENTS FROM BAYWATER FARMS! You can find our fresh, non-GMO, sustainable fall squash in national grocery store chains, produce distribution companies, roadside farm stands, local farm-to-table restaurants, CSAs, and farmers’ markets. To learn more about ordering our fresh local produce, click here. At Baywater Farms, we are dedicated to providing you with the freshest, most responsibly grown produce. We serve Baltimore, Washington, DC, the state of Maryland, the beaches of Delaware, and beyond! If you’re looking for the best-tasting produce, contact us today! You can reach us by phone at (443) 783-4185. To stay connected with the latest Baywater Farms news, follow us on Instagram, YouTube, and Pinterest! Be our friend on Facebook, and follow us on Twitter and Google+. This entry was posted on Friday, September 28th, 2018 at 3:39 pm. Both comments and pings are currently closed.